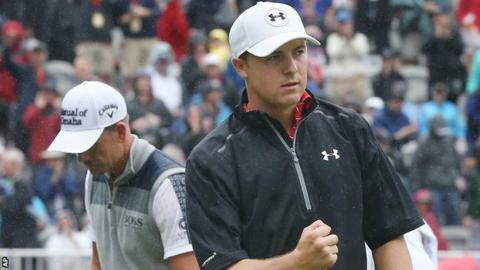 Jordan Spieth fired a third round two-under-par 68 as he mastered the wet conditions in Atlanta and replaced Henrik Stenson at the top of the Tour Championship leaderboard. Spieth, winner of two majors in 2015, will collect a first prize of £922,266 and a bonus of £6.6m if he wins the final competition in the FedEx Cup. The American, 22, is on eight under and has a one-stroke lead over Stenson. The Swede, who held a three-shot lead overnight, shot a two-over par 72. Stenson would also win the overall FedEx Cup with victory on the East Lake course, but will have to improve on a Saturday display that saw him post four bogeys. Spieth, in contrast, ended his round on a high with a brilliant 20-foot birdie at the final hole. "I thought we were tied," he said of his battle with Stenson. "I didn't realise I was leading until about 20 minutes after I finished and someone mentioned it." His compatriot Rickie Fowler, another who would pick up the bonus with victory in Atlanta, is four shots behind along with England's Paul Casey. Northern Ireland's Rory McIlroy, who has a very slim chance of taking the £6.6m, is on three under after a level-par 70. Also on three under par, and another with a chance of the £6.6m, is American Zach Johnson, who must win while Australian world number one Jason Day finishes tied second or worse. Day, who has won three of the previous four tournaments he has competed in, is level par for the tournament.